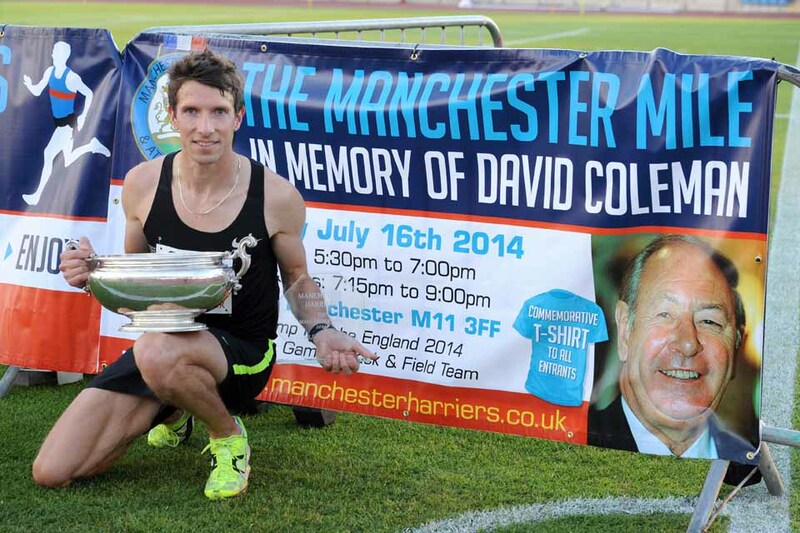 FASTEST ATHLETE (Male or Female) TO BE PRESENTED WITH THE MANCHESTER MILE TROPHY [PLUS TROPHY TO KEEP] IF THE FASTEST ATHLETE IS MALE THEN THE FASTEST FEMALE TO BE PRESENTED WITH THE ROSE BOWL [PLUS TROPHY TO KEEP] IF THE FASTEST ATHLETE IS FEMALE THEN THE FASTEST MALE TO BE PRESENTED WITH THE ROSE BOWL [PLUS TROPHY TO KEEP] TROPHIES, UNLESS THE FASTEST ATHLETES ARE VETS, ALSO TO THE FASTEST MALE VET (min age 40); THE FASTEST FEMALE VET (min age 35); THE FASTEST MALE & FEMALE U15 & U17 and to the FASTEST U13 BOY & U13 GIRL in the 1500 metres COMMEMORATIVE T-SHIRT TO ALL ENTRANTS First staged in 1943, this event hadn’t been held since 1952 until it’s resurrection in 2014. 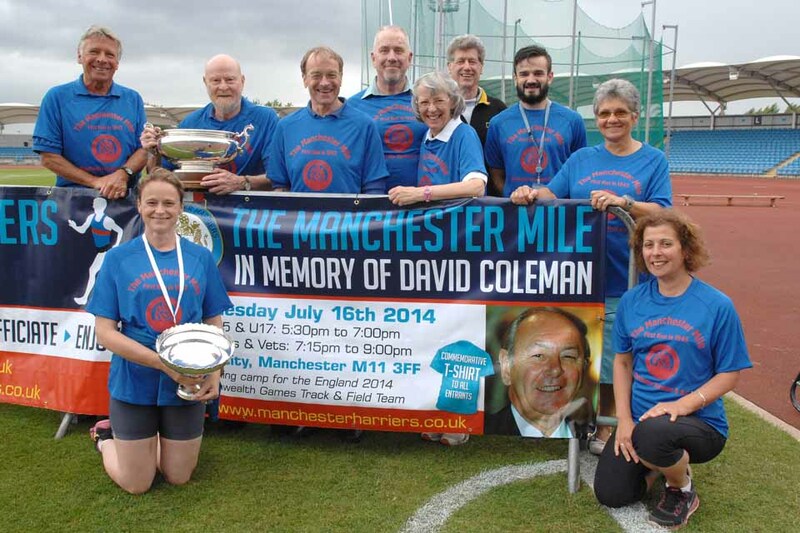 David Coleman was the Winner in 1949. Download the entry form here. 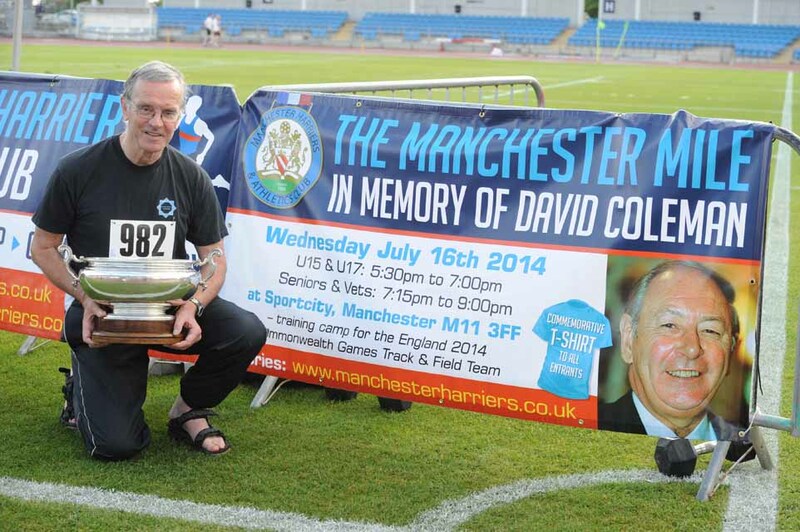 Online entries here. and some photos of the event here (hsphotos) and here (club flickr account). If you would like to add some photos to the album, you can email them to normal75either@photos.flickr.com and they will be added. Something special happened on Saturday and if you were lucky enough to witness it you were watching probably one of the best ever runs from Beth Barlow. 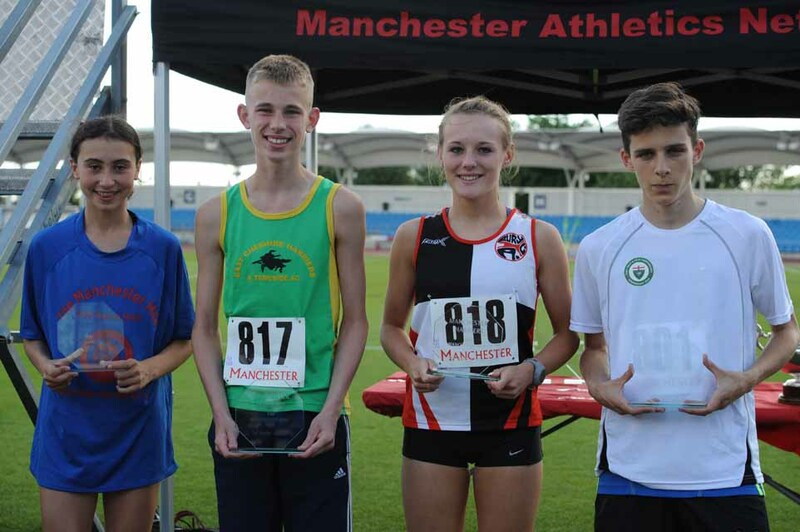 After an extremely sensational performance at the Mason Schools Trophy, she qualified with a time of 4:35.9 to run in the English schools championships representing Greater Manchester schools. 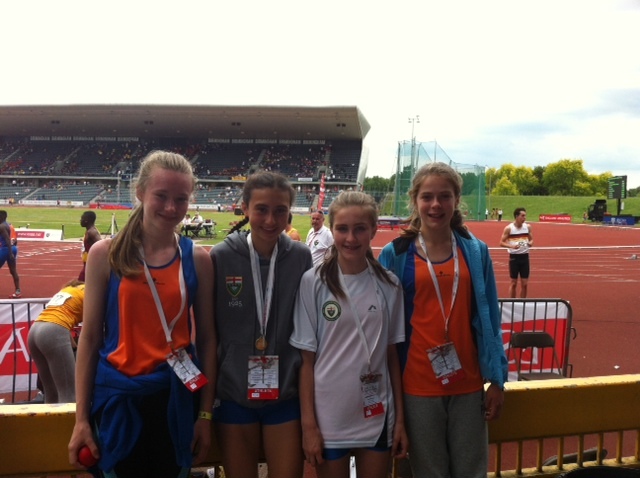 Although this was a monumental achievement in itself, Beth went on to run the 1500m heats on Friday, coming in a remarkably close second place retaining her good form and resulting in a place in the English schools final. This accomplishment was exceptional but unsurprising, acknowledging how much effort she applies in training and all of the races. Then on Saturday (the day of the final), Beth seemed calm and prepared with her foot behind the starting line. There were 11 other competitive girls in Beth’s race, all posing a great threat. 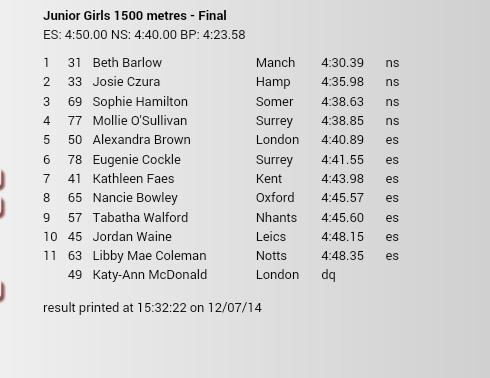 One of whom was Katie Ann McDonald, who is number 1 in the UK rankings in Beth’s age group. The starter gun fired. The rushing stampede of talent had begun. 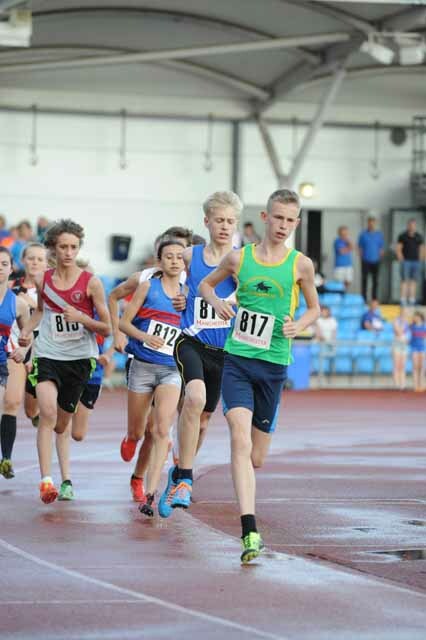 Beth eased herself in to a great position, going off with a swift, yet comfortable pace. After the first 400m she snatched 3rd place using her competitive edge to maintain her pace. After 800m (2 laps) a small gap had emerged but she still held 3rd place. Then at 1100m, with just one lap remaining, Beth made progress, after retaining her energy she burst into 1st place, passing Katie Ann McDonald who also made a move in attempt to stay with Beth, both leaving 3rd place behind. With 200m to go Beth tired slightly, allowing Katie to take the lead. Beth kicked drastically early, meaning that she would only have a limited amount of energy for the remainder of the race, but showing no sign of weakness. They entered the home straight and Beth gained on Katie. A gap opened up in lane 1, Beth made her move. She was alongside Katie and was pulling away. With 50 meters to go Katie cut of Beth, making her lose momentum and balance, meaning Beth couldn’t pass into the lead. 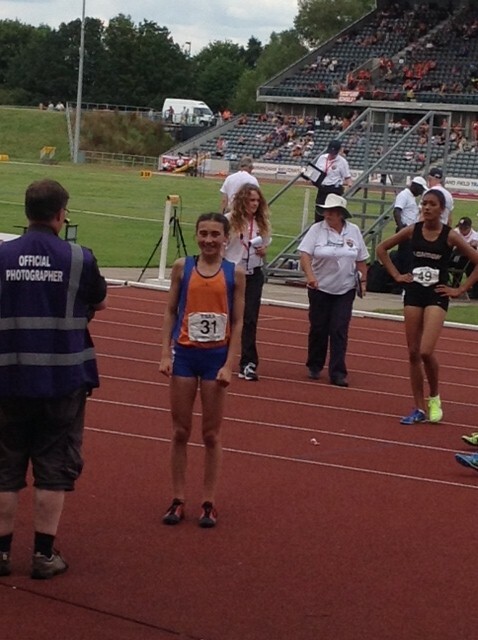 Beth still finished strongly despite almost being pushed off the track and achieved a marvellous PB of (4:30.39). Although second, Beth still left the track smiling. All was not lost as Katie was disqualified for breaking the rules. Beth had secured her position; she was first, what an amazing finish. 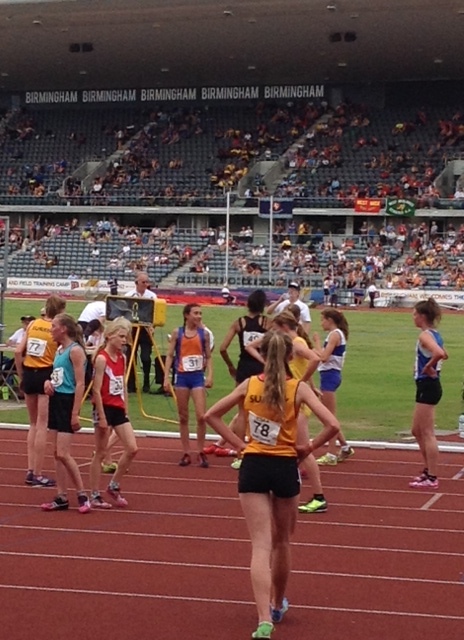 Now Beth’s the English schools 1500m champion, she should be incredibly proud of herself.